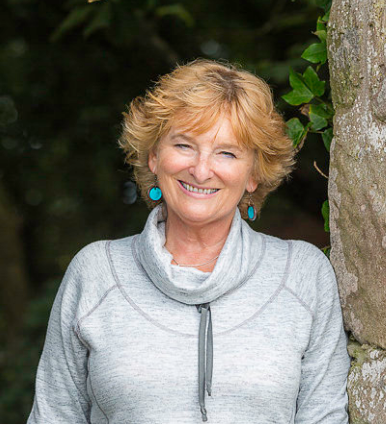 This month’s World Travel Blogger is Keith Kellett, a free-lance writer and photographer, originally from Cumbria, but now living in Southern England, a short distance from the ancient stones of Stonehenge. His travels have taken him to most of Europe, Cyprus, Oman, Egypt, Jordan, Tunisia, Kenya, the Gambia and Australia. 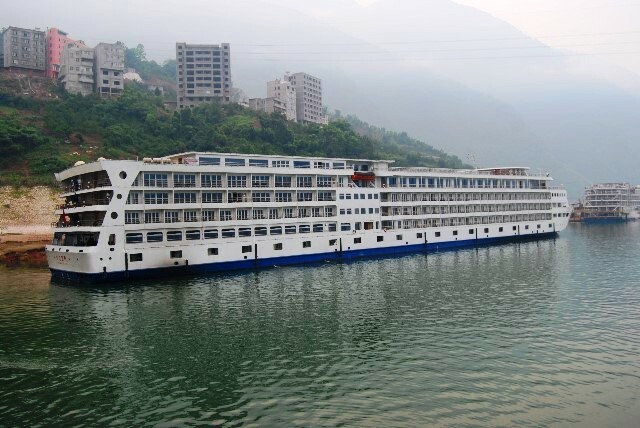 Here’s his account of a recent cruise along the Yangtze River in China. We arrived at Yichang in the early evening to board the Yangtze 2 for our Three Gorges Cruise. We weren’t going anywhere that night, though; the ship wasn’t going to sail until the morning. We’d upgraded to an Executive Suite, although all cabins have a balcony. From here and the impressive glass elevator we sometimes got views of the scenery outside the ship – and sometimes, views of a rather dilapidated dockside or a ship moored alongside. It’s a reminder, though, that the Yangtze River is, first and foremost, a commercial waterway and the towns on its banks industrial ones. 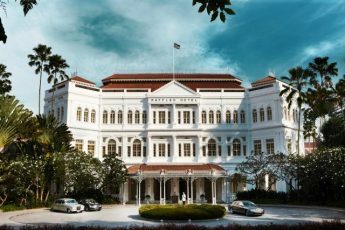 Nevertheless, if this is accepted, enough remains for it to be an unforgettable cruise – whatever the weather. So quickly and efficiently did we get away the following morning that we hardly noticed it. Breakfast was a bit of a scramble, but buffets usually are. The food was, of course, Chinese; a pick-what-you-like, all-you-can-eat buffet. The ship was only a couple of years old, and well presented. Our cabin was roomy and spacious, in which we settled comfortably while we waited to see what the next day brought. Two programmes are on offer each day; one is included in the fare, the other an optional extra that you have to pay a supplement for. Our first excursion was the optional one for that day. It looked like chaos at first, with all the crowds, and the guides trying to outshout each other, for ours wasn’t the only ship moored here. 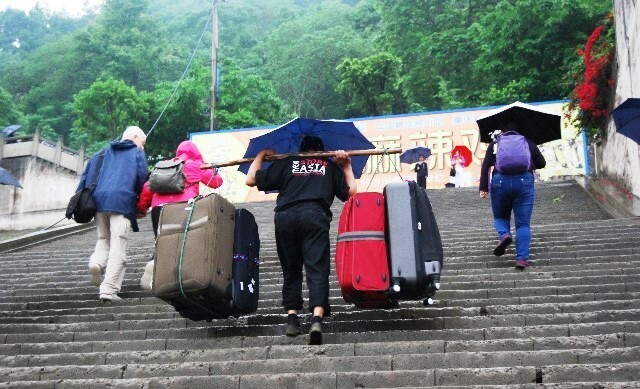 But, some sort of order emerged from the confusion, and the â€˜Tribes of the Three Gorges’ turned out to be an unmissable trip. 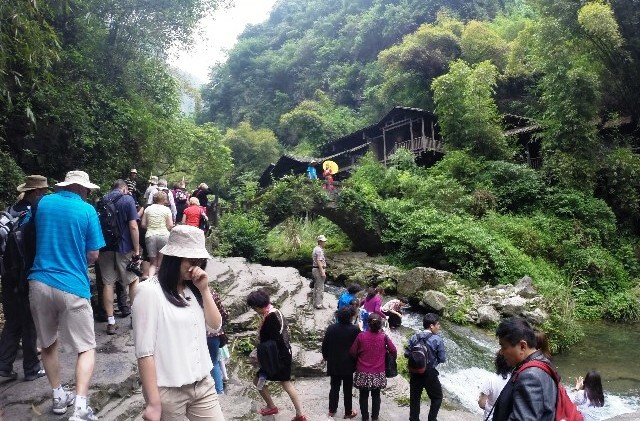 We moored in the Xiling Gorge, and hiked up a tributary gorge following the Dragon Stream. 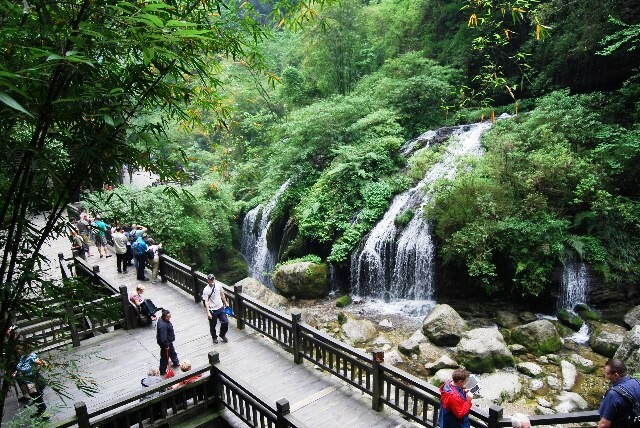 Most of the way, a boardwalk is provided, and, if it’s not there, it’s an easy path, Almost the first thing you see is a traditionally dressed lady in a sampan on the stream below. 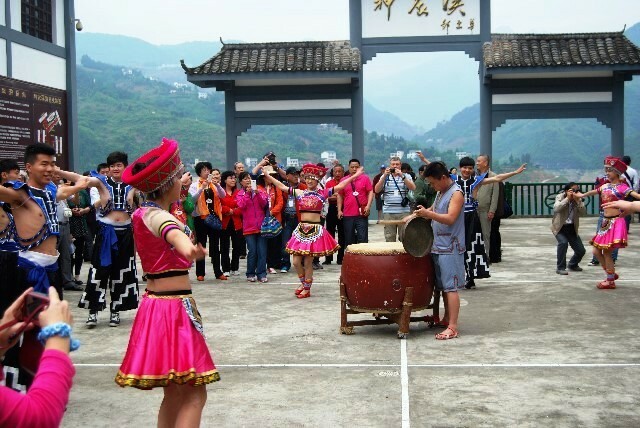 All the way up the gorge, you pass traditional Chinese buildings, water wheels, cormorant fishermen â€¦ They’re showing China as it used to be – or maybe, as we imagine it used to be. The jury’s still out on that one. There’s natural beauty here, too. Everyone stopped to photograph or video the monkeys; the waterfall was pretty, rather than spectacular and, on the way back, they showed us a re-enactment of a wedding ceremony; I nearly got ‘fingered’ to be the ‘groom’, but I got out of the way in time, and another was chosen instead. When we got back around lunchtime, we found the laundry we’d left out before we left had already been delivered. Full marks for that! In the afternoon, we went on the ‘included’ excursion, to the Three Gorges Dam. I’d already seen a couple of videos put out by the National Geographic Society videos and was expecting great things. After all, the dam is massive enough to actually slow the earth’s rotation, thus lengthening the day by a fraction of a nanosecond. There’s a better view of the ship lock, but, in a lock this size, watching a ship lock up or down, a process which takes about four hours, is an exercise akin to watching paint dry. However, the ‘ship lift’, which should be completed next year, will raise and lower vessels much more quickly, and might be more interesting to watch. Unfortunately, the kindest thing I can say about this excursion is that it’s three hours out of my life I’ll never get back. After a lot of up-and-down on escalators, the viewpoints provided don’t give the best view of the dam by any means, and it’s difficult to appreciate its size and grandeur from this angle. I did get some good pictures later, when our ship went through the lock, and I was able to photograph the ship in front of us, festooned with lights. We were awakened in the morning by the squawking of a loudspeaker – 6 a.m. from the ship moored alongside. There’s probably an ancient Chinese torture called Death by Loudspeaker, for it seems that life everywhere is ruled by announcements, even at mealtimes, telling us stuff that we already knew from the daily handouts anyway. The guides sometimes carry portable loudspeakers; our excellent Linda Yang gets extra points because she didn’t. 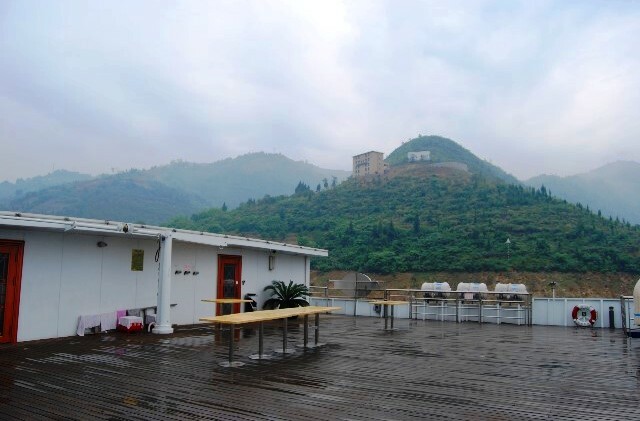 The next day’s excursion on the Yangtze River was a sail up the Shenong Stream; a ‘stream’ no longer since the dam was built and the gorge flooded. Previously, boats had been man-hauled up the stream by gangs of men called ‘trackers’, nowadays employed as luggage porters. 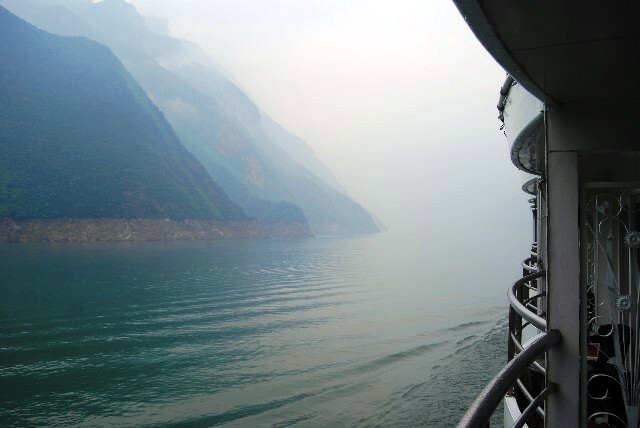 But, it’s now possible to sail up the gorge on a boat … Not in the Yangtze 2, though. It’s too big for that. We transferred to a ferry, which would have given some excellent views if not for the haze and mist. But, having said that, many Chinese paintings show misty scenes, so maybe it’s a common occurrence around here. We came ashore at a Cultural Centre; strictly speaking, below the centre, for we had several steps to negotiate to achieve it. We watched a demonstration of music and dance, and someone described the work of the ‘trackers’, which, before the dam, consisted of man-hauling ships and boats up the stream. Their traditional garb, we were told, was silk shorts – but, in practice, they chafed so much that they actually worked naked. In the centre of the square outside, a drummer thumped out a repetitive boom boom CLANG; boom boom CLANG. I expected the ghost of Freddie Mercury to appear at any minute, and start singing ‘We Will Rock You’! So, we chose to stay on the boat for this one. But we did watch a constant stream of umbrellas going ashore to brave the elements, determined to get their money’s worth. Fengdu was as far as the Yangtze 2 went this trip. 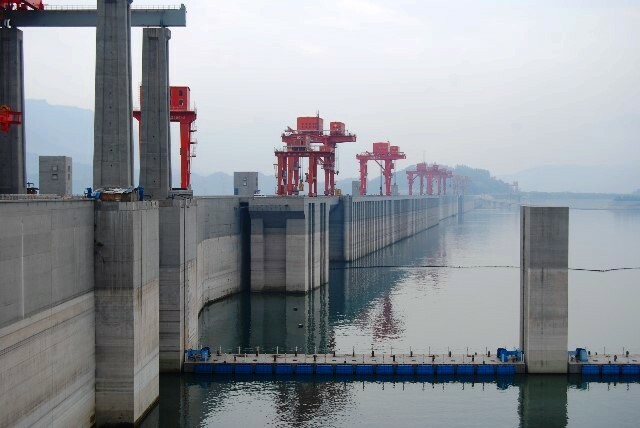 It was planned to terminate at Chongqing, but the river levels dictated it couldn’t go any further. So, the following morning, we disembarked; the luggage carried up those steps four, or even six cases at a time by trackers, using a yoke. 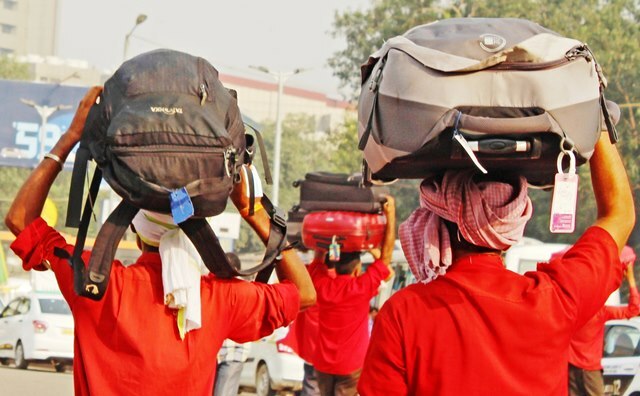 The service of man-hauling ships and boats up the stream is no longer necessary, they’ve simply become luggage porters. We settled down for a four-hour coach ride to Chongqing, where we had lunch. We ate in a first-floor restaurant, with a covered balcony giving good views of the busy street below. A good location for some candid street photography. We had a dish of minced beef mixed with noodles, and a thought came to me. Was is possible that Marco Polo was familiar with this dish, and the dumplings of Xi’an, and took the recipes home with him – to develop into ravioli and spaghetti Bolognese? Keith Kellett writes about and photographs food and drink, beer, old cars, railways, beer, steam engines, historical re-enactments, bygones, beer, gardens, travel, beer and brewing, nature and the outdoors and beer. He’s presently trying to get his head around video and podcasting. Read more by Keith on his engaging blog Travel Rat. All images © Keith Kellet unless otherwise stated. What a very memorable trip this must have been. I can almost see the scenery slipping by and feel the rain as the ship drifted along this famous river! I loved the picture of Fengdu! Maybe we should have braved the elements and gone; maybe next time? Thanks so much for writing this article Keith. Great to see both sides of this cruise. 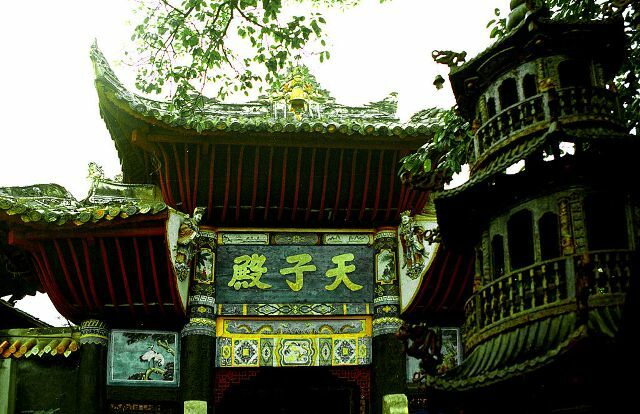 It’s always difficult to knwo whether to go on these excursions but if you get the chance to revisit Fengu does look fascinating. Look forward to reading more about your adventures on yoru blog. It must have been a very memorable trip – the dam is a massive engineering feat. Didn’t know that about slowing the earth’s rotation. Neither did I John. I had heard it has affected the lifestyle and ecology of the area and it will be interesting to see how that is managed in future. 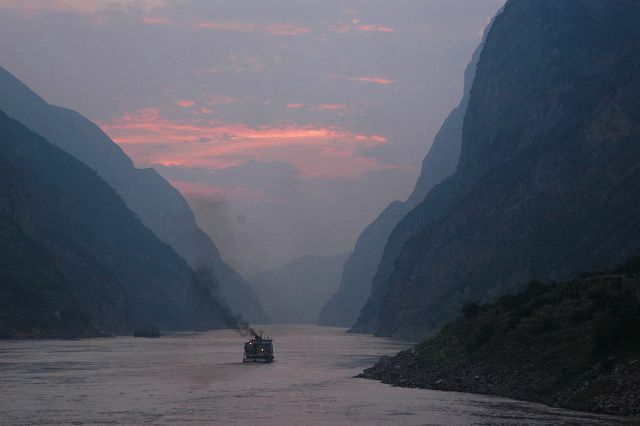 Still must be one of the world’s greatest river journeys.